So, here it is. I promised to make the thread on March 1st already, but for some reason I decided to hold it up for a bit longer. Instead, March 10th it is. For the few of you out there who have been following me the past two months (or who have been checking the Screenshots thread and/or #serioushax) know that I have been working on a hack. It is my sixth (or third serious) attempt at a hack, and hopefully the first succesfull one, even if only for a demo. 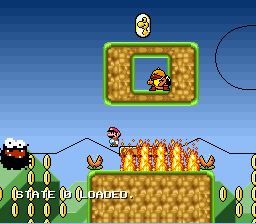 However, my latest previous attempt was back in Spring 2009, and I was a whole lot less experienced with SMW hacking back then (but not too much). So I suppose that it's going to be different this time. Despite my previous failures, I am destined to borrow a few ideas from those earlier hacks. 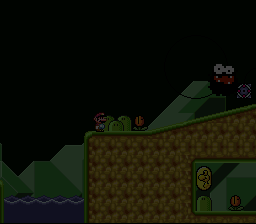 If anyone cares to see which hacks those were: Pokey and Kolorado & Mario: Old Plots, New Villains. For example, I want to incorporate certain bosses into the story and plotline. So, what exactly IS the plotline of my hack? I shall explain, without telling the story of the end. That is to be a secret for now, though I have to say I have a good idea of what I am going to make this turn out to. The story is built around the character of Roy. I know, pretty egocentric, but the plotline is based around egocentrism. You'll see that later. Anyway, Roy walked around in a dark place, and a deceased professor, Dr. Bloock, his former worst enemy, came by him at that moment. The undead ghost of Dr. Bloock attempted to kill him, but Roy was quick enough to flee from the scene. By fleeing, however, he left behind his "dignity". 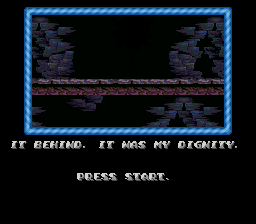 Now that Dr. Bloock got ahold of his "dignity", Roy becomes a whiny attention whore and calls in help of Mario. 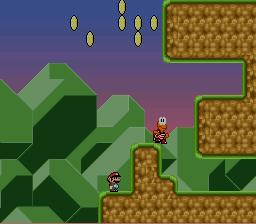 Since my speciality in SMW hacking is ASM, you may expect a gimmicky hack. However, I am not going to base my level design around the gimmicks - level design is still number one for me, and gimmicks should accompany it. 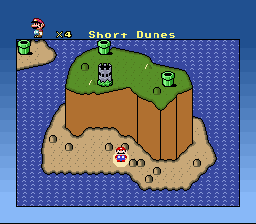 I am terrible with music, so there's a big chance I'll just select my sound track from SMWC's sources (there's plenty here though), and chances are even that I am just going to use a couple of SMW tracks too. Graphics-wise, well... that's what you could call a mixture of chocolate and vanilla, since I actually do like to use some of SMW's graphics (as shown in the following screens). Hm. Furthermore? I don't think I have anything left to say. This is the Nintendo Presents screen here. 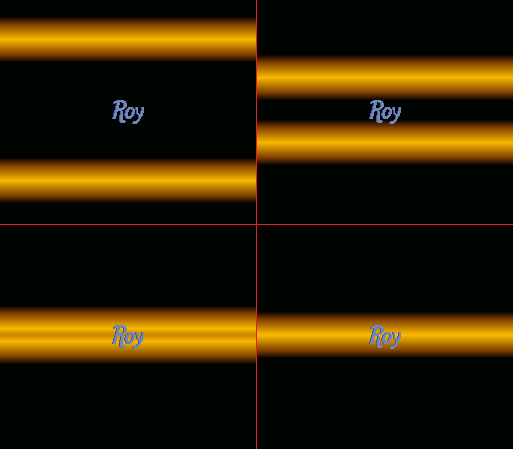 The idea is simple - the screen fades in to the highest brightness setting, then you see "Roy" in the middle and two HDMA beams, one on top and one on the bottom. These beams move towards eachother until they eventually merge. When they have merged, the game will continue to the titlescreen. No pictures of the titlescreen just yet. I did start a little on it, but there's nothing noteworthy to show yet. Instead, let me show you the intro screen. This basically consists of wavy HDMA effects and Layer 3 text that goes up a bit. Nothing special. There are two "phases" in the intro screen - in both, text scrolls up, but in the second phase you will see Roy coming out of the dark suddenly. ...that is what happens when you go from phase 1 to phase 2. After that, it is just more text scrolling up. Press Start to go to the OW. The first submap. I was pretty proud of it myself when I made it, since I am not really a great OW designer. This game has a day/night cycle system, with a 24-hour timer. It counts in hours and minutes, with a minute being added onto the timer for each IRL second, but the time only increases within levels. So no, it does not use the time of your PC clock. Sorry, but I felt that was just unnecessary. The OW border changes depending on the time. If it is between 19:00 and 6:59, the border uses the "night scheme", whereas if it is between 7:00 and 18:59, the "day scheme" is used. When I took this picture, I believe it was 6:40. You can view this timer within the pause screen during levels. This, for example, is the OW during the day. The start of the first level. 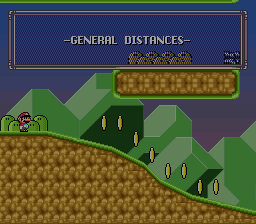 A message box pops up the first time you enter this level, giving distances to each place of importance on the submap. Oh, and the background HDMA changes per hour too. Right now it uses the HDMA gradient which is used between 6:00 and 6:59. 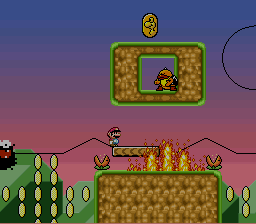 As for the SMW background, I had comments on it that it clashed a bit with the foreground. I personally believe it doesn't clash, but I do have intentions on changing it to a somewhat more... idk. A background that has to do with grass dunes. This Pokey here has varying speeds depending on whether it's day or night, and it also depends on chance (during the night he is almost always faster than during the day though). Initially I just used him here because Sumo Brother is an underused enemy, but he's actually useful too. 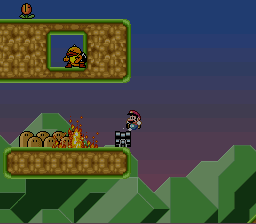 Oh, and I fixed a bug that occurs with the flames. When they strike, and you stand about 8 blocks underneath it, you can still be hurt by the flames. Did you know that? That's right. A metal detector! In all seriousness this first level possesses great secrets already, having an alternate path with many obstacles but also a rewarding end. But I am not going to reveal what that all is. This is the beginning of the alternate path that I was talking about. 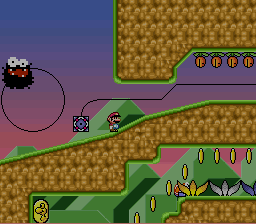 The difficulty of this jump and the two coin arrows pretty much should give you a warning that if you think you can't handle the difficulty, you should jump down and take the path below. Just to show that the time changes. This is around noon. And last but not least, for those who haven't seen it yet, here's the pause screen. I didn't really work much on it since then, so it's still pretty actual, but expect radical changes within a couple of weeks. Aaaaand... that's it for now! By the way,you created that giant fuzzies? So much for wanting to "start fresh". WOW! Amazing! I love the looks of these screens, Roy! The ASM combined with lovely level design and gimmicks is superb. The OW is also very nice. I love the giant fuzzies. The HDMA effects are just... just... no words for it. I really hope you will finish this hack, Roy. This is looking like one of the bests on the site. Has Roy ever been known for his sanity? Edit: Adjusted the mouth a bit. It looks less idiotic this way. Awesome! Just Awesome! I really like the menu. And the Fuzzys. Will they make Yoshi dizzy and drunk? Alcaro, I kind of find the blocky Fuzzy to look nicer than your version, to be honest, even though it's rounder. I may change its graphics, though. 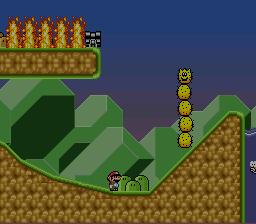 Rockythetigre: Er, these Fuzzies will probably become inedible, though I might consider pulling that one off, since I have never seen it done in SMW yet. But that gimmick is not top priority yet. Far from it. In general: thanks for the comments guys. How many Versions of a fuzzy will excist? Depends on my creativity. At least Megafuzzy, Spittin' Megafuzzy (a Megafuzzy that spits out regular Fuzzies) and Ferdinand Y. Fuzzy, a Fuzzy boss which was featured in the first level of Pokey and Kolorado (if you google it, you will see which one I mean, though the new version will behave a lot more different). I also want to create 16x16 Fuzzies that bounce around like in Paper Mario, maybe 32x32 ones too, and if I try the Yoshi's Island Fuzzy, that makes 6 new species. And maybe I will come up with more ideas. Just by looking at it my mind exploded. The HDMA, the day/night feature and your title screen is all just amazing. I don't have any other word for it and I must say that I'm hoping that this doesn't get cancelled, as opposed to your other projects... Keep it up! I wouldn't know, to be honest. That's the most different Fuzzy of all, the one that makes poor Yoshi dizzy! how do you change the gradient? are you using a RTC or something? This looks so terrible, I hate you so much Roy. Ixtab: No, my first post perfectly describes that the system is very simple. No such chips involved. Roy, you never cease to blow my mind. And of course you've done it again. Any prediction for when we're gonna get a demo of the hack? Looks fantastic! I especially like the real-time night and day system, it must've been hard to code. oh i didn't notice that. looks decent, i'll play it when you finish to give you a full verdict. In all seriousness, I am going to be cautious on giving any date for a demo release. I know myself too well to imagine that I would be able to reach deadlines - I can't, I'm always a week or so late. Additionally, at this point I really cannot predict how quick I will finish each level - I want a substantial amount of work done before I release a demo, and it's only guessing how much time that will take. However, since I am not involved in any other projects anymore (hooray for ragequitting in November! ), and don't intend on being involved in other projects anymore (except for maybe one thing in SMWCP2), I can spend all my hacking time on my own hack. Jeorge535: Actually, it was pretty easy to code. What was more difficult was setting up the HDMA background gradients so they would look right and not "clash" with the one that went before it (during hour-to-hour transition, i.e. 5:59 -> 6:00). Isn't it great that I knew what tileset you will use for level 1 without having seen it before? Because I always use that tileset? 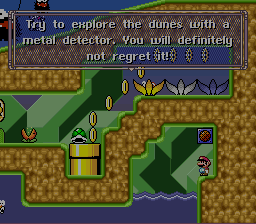 Yeah, except I actually should've used a sand tileset, thinking of it. 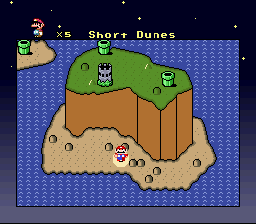 Oh well, it doesn't really matter that much, it's not a desert level yet. Also, I gave the Fuzzies new graphics.